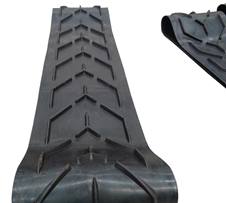 Chevron Belt – Standard Industrial Inc.
Chevron conveyor belt is designed to convey loose, bulky or bagged materials on inclined surface at angles of less than 40 degrees. 3. Cleat pattern, angle and pitch are designed elaborately.